Thistle Fleet #69 was founded in 1955 as one of the original fleets of ISC. Our fleet has about 15 boats, sails in over 50 club races during the season, and hosts two invitational regattas: the 8-Ball Regatta in April and the Naptown regatta in September. Our fleet membership is diverse, both in people and their competitve level, from novice sailors to past National Champions. The Thistle Class is recognized as one of the largest and best one design classes in the country. 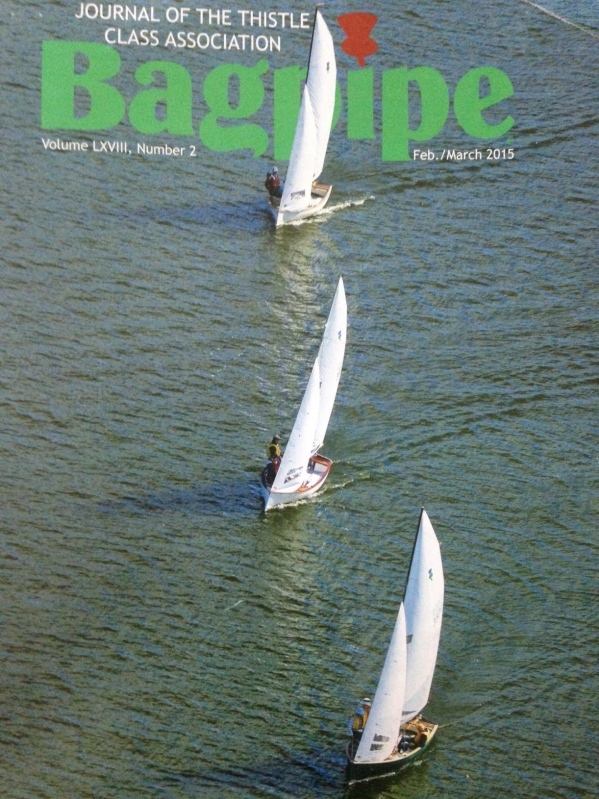 This is the most recent cover picture of the Thistle Class magazine, the Bagpipe, of 3 ISC Thistles on Geist !! The Thistle was designed by Sandy Douglas in 1945 as a 17 foot, plumb bow, one design sailboat that could be raced by two or three, or day sailed comfortably by as many as six people. Thistles are very light because they are completely open, having no deck to add weight. This open design allows it to carry more people comfortably while making it extremely fast. Its round bottom hull makes it very responsive & exciting to sail. Thistles have the highest Sail Area / Weight ratio of any fleet @ISC...they are VERY fast. The Thistle Class has over 4000 boats & 65 fleets. The National Championships attract 60 or more boats each year. Older boats are still very competitive. Boats over 40 years old place highly in major class regattas. The Thistle is a unique blend of a high performance racer and a roomy family day sailor. During fleet racing at ISC the Thistles starts as the 1st fleet because they are the fastest. Thistles are remarkably fast in light air because of their high sail area to weight ratio. Get to know us and let us give you great sailing experience in a wonderful boat! Contact any member of our Fleet to learn more. We have a Fleet boat available for you to try out, and have just purchased a boat that is available for sail and purchase. Click on the items to the left to learn more and see some great photos and videos ! Visit the Thistle Class website at www.thistleclass.com.